1 of 3 Quarter squash, zucchini and eggplant lengthwise and cut in half. Quarter peppers and discard cores and seeds. Cut onion into thick slices. Cut tomatoes in half. Place vegetables in a large bowl along with mushrooms. 2 of 3 In a small bowl, combine marinade ingredients and mix well. Pour over vegetables, cover and chill for 2 to 3 hours. 3 of 3 Heat a charcoal or gas grill to high heat. 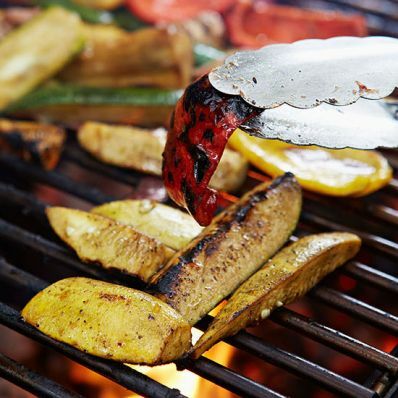 Remove vegetables from marinade and place in a grill basket or on grate directly over coals (approximately 450 degrees ) for 3 to 5 minutes on each side, turning once. Transfer vegetables to a large serving bowl. Add parsley, mix well and serve.